I’m not gonna talk too much about this movie since most people probably haven’t seen it. But I will talk about the appeal of bad movies since you have most likely experienced many a bad film in your day. The basic gist of The Lost World (not the sequel to Jurassic Park, but based on the Arthur Conan Doyle novel), is that a team of explorers and hunters travel to a remote area in the Amazon where they believe that dinosaurs still exist, to study them. Sounds like a hit right? Well it was! Boasting wonderful technicolour, a fantasy world similar to that of King Kong and special effects that were entertaining...for the time. The spectacle of this film was of course the dinosaurs (as well as the giant spider, monster plants and cannibal natives). 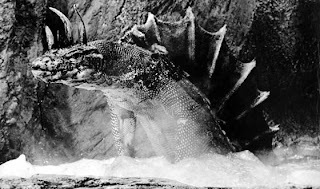 The dinosaurs were created by literally dressing up iguanas with fake horns then “seamlessly” superimposing them into the scene as if they were 50 feet high. “Look! It’s a tyranosaurus rex!”, they would say as a baby alligator looms over them with a bunch of plastic horns and painted spots all over him. Although the movie was impressive and a big spectacle for the time, watching it today, you can’t help but notice how cheesy or dated it is. Even though I get great joy from watching a dressed up baby croc play fight with a dressed up monitor lizard (for about 5mins straight), I can’t help but laugh at the movie. But is that such a bad thing? I’m sure the film makers knew they weren’t putting together the Citizen Kane of dinosaur movies, but I bet they didn’t want their project to be laughably cheesy either. At the time, it was probably entertaining and really cool, but over time, a film can become really dated and it’s original intentions can be turned around. To me, The Lost World has become one of those movies that is now so dated and silly that it is immensely entertaining. The cheesy dialogue, acting, effects and scenery is often so bad it is fun. It is a movie that has become so bad, its good! There are many other examples of this. There are movies that are meant to be silly upon original release and are still great for the same reasons (the original campy 1966 Batman! and Mega Shark vs Giant Octopus). There are movies that were meant to be good, and are now just so bad and funny (Plan 9 From Outer Space and The Room). And then, there is the bunch that were just so bad, they are still bad and just horrible movies (Batman and Robin and Battlefield Earth). This last set has the unfortunate fate of being awkwardly bad, so it is impossible to enjoy them even on a mocking level. Summary: The Lost World manages to hit that sweet spot where it’s bad enough to have fun with, but never crosses that awkward line of just being unwatchable. I would even go so far as to recommend this movie if you want a fun watch. It manages to sneak up to #456 of all the movies I’ve seen on flickchart.com.